Posted: Thu 11 Sep, 2003 3:16 pm Post subject: How about some Iberians? Sone more tidbits that might interest you. Last year in Solingen I was presented to some nice old fellows. These are two of them. I was impressed. You may like them too. The first is a falcata in rather good condition. It feels if it has some sound steel below the rust as the weight was there. Sturdy spine and a keen edge geometry. A well preserved antennae sword was equally impressive. The hilt was made in a all-steel construction with a hollw grip that still showed the seam on one side. Not welded shut, just made to fit very tightly. 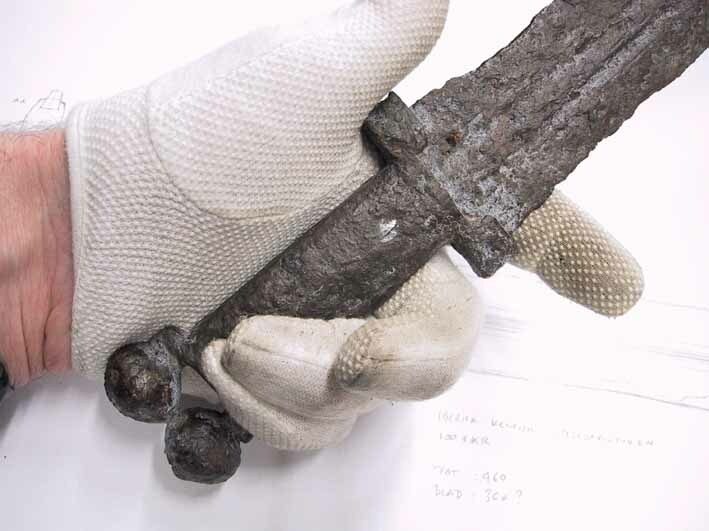 The cross, or guard, was wrapped around the base of the blade and fastened with two rivets. Some file work was added sparingly to great effect. The spheres at the end of the antennae arms were hollow, riveted together by the protruding arms. I think there exist some swords of this type that are slightly longer, but not much. This was not much bigger than a very large dagger, but absolutely had the feel of a sword. I have always liked the looks of a Falcata. Seems to me that it would be a nasty weapon too. What is the bladegeometry like? Does the edge start from the spine so to speak, or it is more oval in shape? Again, to get an idea of its size my left hand is holding the sword. As you see the girp is not very long. If you grasp it tightly your hand will be pressed between the guard and the antennae. It is no uncomfortable but makes for a very secure grip. It does not show very clearly in the photos, but the blade had a nice and crisp cross section with a set of fullers and risers that were skillfully filed and/or ground. In the falcatahelbild jpg, on the drawing you show some additions on the hilt. Are these just measurement lines or some speculation as to additional structure that has been lost? The very sharpness of the edge was coated in rust and a bit eaten away, so we´ll have to guess a bit how it was originally. It is not a shot in the dark however. 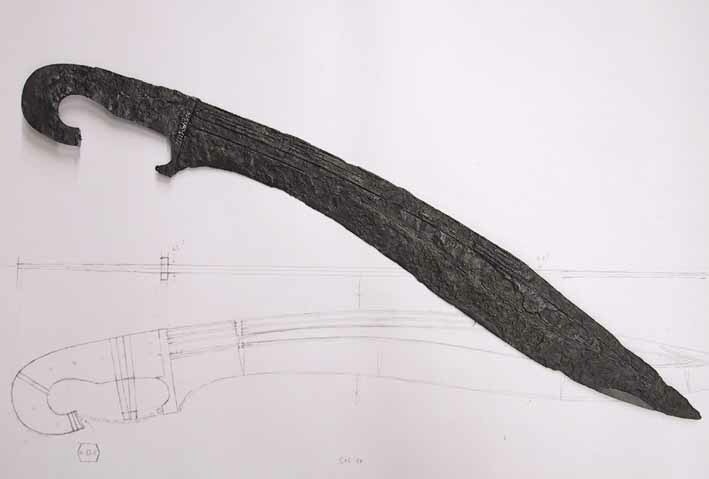 The blade had a cross section that was like a very thin triangle, some 6.5 milimeters at the thickest. The edge would have been sharpened with a slight convexity in the last three or four milimeters or so. The section of the blade was fine and well defined. The sharpness would have been formed from a thickness of a milimeter or slightly less. The thick part of the blade was made lighter with a set of grooves that were flat in the bottom, not rounded. I got the impression they were cut with a sharp chisel. Very crisp. There was a broad sunken area that might have held a panel, perhaps of silver (perhaps with engraved designs)? On other flacatas the cross section is more dynamic I have seen an example where the edge was more like a pointed drop and the main face of the blade had a concave dip, or wide fuller, from the thick spine to the rising thickness of the edge. This is alike some well made kukri knives you can see today. At the end of the grip there is a small hexagonal plate riveted in right angles to the tang. 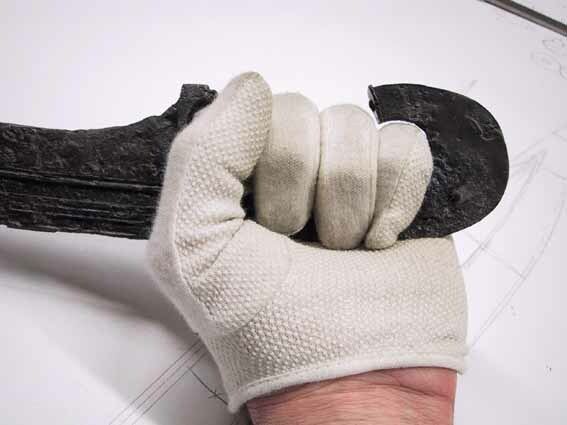 This gives a clear indication to what shape the grip scales were fashioned, at least toward the end of the grip. There is a small ring integral to the blade at the spur of the guard. This indicates there was once a small chain between the end of the grip and the spur of the guard. I sketched this chain in, just as a remainder. My guess is that this could have been made from a contrasting material, perhaps bronze or silver. Or it may just have been iron and rusted away. Sorry, the cross section was not that flat as I first said. From the grooved part it curved gently down to the edge, giving the last half of the blade toward the edge a convex shape. It still was fairly thin, though. The upper half of the section, towards the spine had a taper to it so the start of the convex part was thinner than the spine. Posted: Thu 11 Sep, 2003 8:08 pm Post subject: Distal taper? How about distal taper on the falcata? A lot or a little? Continuous or at different rates along the blade? Posted: Fri 12 Sep, 2003 12:11 am Post subject: Re: Distal taper? Taper in the tang and varied taper in the blade: mild untill the clip point, then more marked towards the point. Wow. More great information! Peter, anytime you post I spend as much time looking at your fantastic technical drawings as I do looking at the weapon! Would anybody else like to see Peter's drawings made available as prints or posters? Every time I see one I wish he had a catalog of his drawings available. I wouldn't hesitate to pay $30 plus shipping for a print describing an historic weapon of my favorite style. Thanks for the information. So, do you think that would have been decorative or functional, and if the latter, for what? Yah... I've often pondered that, and in fact considered emailing Albion the other day, before I realized Peter was frequenting this forum. It seems to me once there was a pic on SFI that has one of this drawings of a rapier, and I was just amazed..
Heck, I'd gladly pay for any sort of well done reproduction of those drawings.. especially if they are 1:1 scale drawings. That would just be too cool. I remember thinking the first time I saw one of his drawings 'wow...theres art *I* can relate to.' and well, since I can't afford one of his swords yet (3 years of law school starting in January) well... this would be cool too. I agree; Peter's drawing are amazing, and it is a real treat watching him when he makes them, commenting on the original. But I fear that he won't publish any drawings, as there will be companies less bent on research on their own that would gladly buy them as well. There is a dream project I hope to realize some time. Together with Patrik Djurfeldt (whith whom I did the original research on the Svante Nilsson Sture sword) I hope to be able to publish some sort of book with information on the european sword some time in the future. We have some thoughts at Albion to make available material of this kind as well. We just have to figure out the right form to do it. There is the aspect that Björn puts forward: with the data available in print, you give away years of preparatory work for the price of a booklet or poster. Still, even knowing for a fact what should be included in a blade, it takes a lot of work and dedication to put it to use. 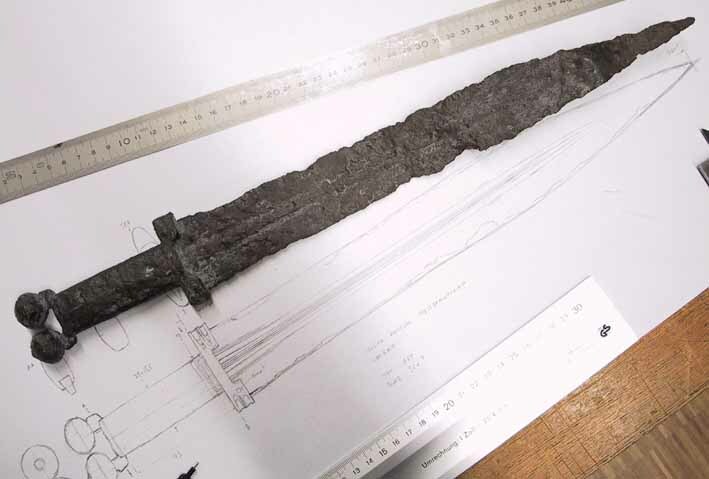 With detailed drawings showing blade geometry of swords from very early to more recent times it becomes very clear that the development of the sword was not one from crude to advanced. From the earliest times blade geometry was highly developed by craftsmen with a deep understanding of the cutting edge. Any chance Albions gonna make a falcata? I know I'd buy one! Thanks for posting, it's great how many famous smiths take the time to post here! No idea but I think it would take some time to get from the drawing prototype stage to having one available since Albion still has a few announced swords still not in production after a few years. There are certainly other custom makers out there but these two options are currently relatively fast and inexpensive for full custom work and both very skilled and talented makers. ( Michael works more at the forge and OlliN mostly stock removal ).